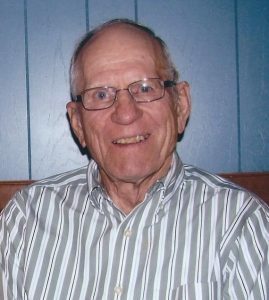 Funeral Service Friday, July 6, 2018 10:00 A.M.
Gilbert Papa, 88, of David City, died peacefully Saturday, June 30th, 2018, at St. Joseph’s Villa in David City. Gilbert Martin Papa, one of seven children, was born on November 7, 1929, to John and Eloine (Hahn) Papa on the family farm west of Octavia, Nebraska. He attended grade school and high school in Octavia, Nebraska and graduated in 1947 from Schuyler High School. Gilbert served his country in the Korean War as a member of the U.S. Army from 1951-1953, where he fought on the front line in the Battle of Heartbreak Ridge. On March 1st, 1959, he married Verna (Jeanie) Heins at Zion Lutheran Church near Garrison. Two sons, Terry and Ron, were born to this union. Gilbert farmed and raised cattle with his brother John, and later his sons, on the family farm west of Octavia. He made hundreds of trips to the Omaha Stockyards and was a cattleman at heart. He attended many local cattle sales and was a regular at the Columbus Sales Pavilion with a permanent bidding number of 40. He passed that love on down to his children and grandchildren through 4-H and years of showing cattle at the Butler County Fair. He and his wife also enjoyed many trips to South Texas during the winter months. Gilbert was a member of the VFW-5814 American Legion, served on the board of the Bone Creek Township, and was a member of the Butler County Feeders Association. He was also a 59 year member of Redeemer Lutheran Church in David City. He is survived by his wife of 59 years, Verna “Jeanie” of David City, two sons, Terry (Karen) of Linwood, and Ron (Shelley) of David City, one brother John (Mavis) Papa of David City, one sister Ruthie (Bud) Gallant of Colorado, a sister-in-law Libby Papa of Georgia, five grandchildren; Molly (Michael) Parsons, Tyler Papa, Josh Papa, Kelsey Papa (fiancé Martin Phillips), and Dustin Papa, two great grandsons, Beau and Tyke Parsons, and many nieces and nephews. Gilbert was preceded in death by his parents, sisters Phyllis Stout, Margaret Papa and Dorothy Papa, one brother Kenneth Papa, and a brother-in-law Elmer Stout.